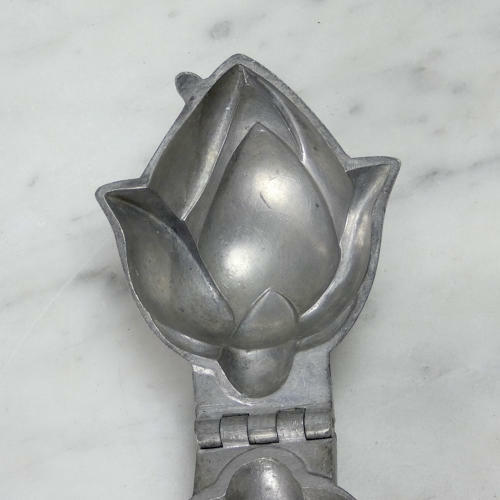 A very unusual pewter ice cream mould in the shape of a bud. This mould is marked, in the casting to one side, 'S & Co 315'. This is the manufacturers mark and the pattern number. It dates from c.1900. This is larger than the majority of small ice cream moulds of this type. The mould is very attractive and would turn out a large flower bud. It is well detailed and it is in excellent condition. The interior is in bright, clean, usable condition and the exterior has quite a light patina. Price includes postage within the U.K. Shipping to the U.S.A. add £8. Western Europe add £5.